English Teaching Zone: The Joker and Ace game! Procedures: Give out 3 Jokers and 3 Aces to each student (it can be a real card or a printed copy). They make a statement while laying one of their cards face down on the table (if the Joker/ Acer figure can be seen through the back of the paper, they’ll need to hide it under a book). If their partner thinks it is false, they can call their bluff by saying “Liar!” If it was indeed a lie, the person who laid the card down takes that card back, and any other cards still on the table from previous rounds. If it was in fact true, the person who made the accusation has to take the card or cards on the table and add them to their own pack. If no accusation is made (people should say nothing if they think the sentence is true), the card(s) stay there for the next round(s). The first person with no cards left in their hand is the winner. 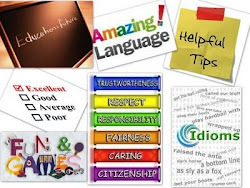 Hints for teachers: This game can be used to work with any grammar topic or vocabulary as long as the teacher gives them the language chunks to be used. Also, it can be used as a warm-up or wrap-up but then, instead of 3 cards, give them 2, so that the game don’t last more than 10 minutes. If you decide to play with 3 cards the game will take around 15 minutes. It's a great activity, for first day of class (back from holidays). With a group of sts that already know each other!